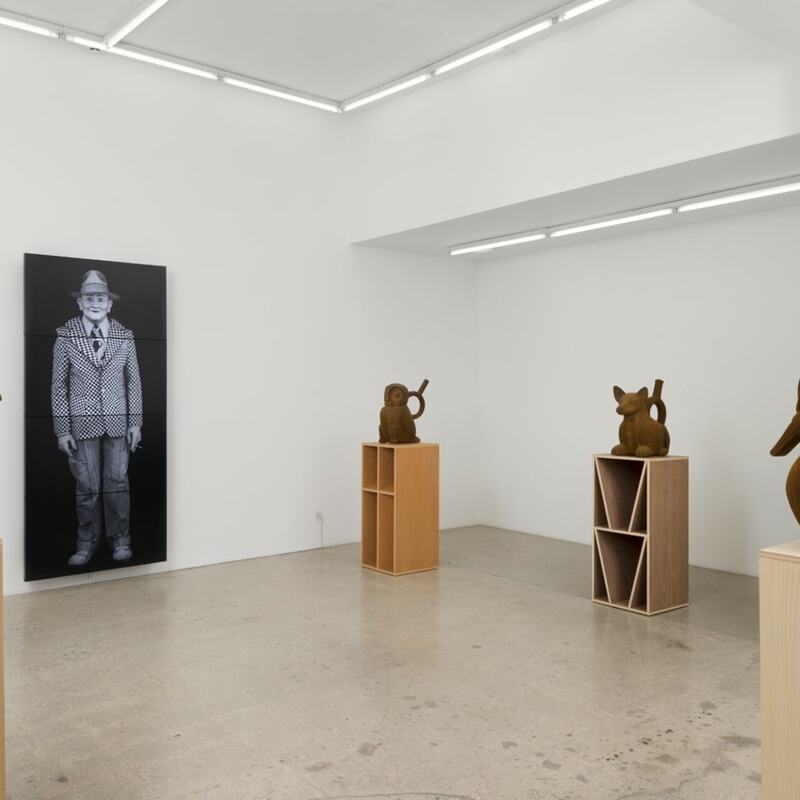 Cherry and Martin is pleased to present, “Brian Bress and Nathan Mabry: Totems,” an exhibition featuring Brian Bress’s wall-mounted video works, and Nathan Mabry’s sculptures. A totem is a spiritual being, sacred object or symbol that serves as an emblem for a group of people. The oldest human art objects are totems. The Lion of Hohlenstein. The Venus of Willendorf. Manifested as a physical object - a sacred axe, talisman, or figurine made by an artisan - totems lend power to the object, helping the user understand and navigate the world around them. Totemic symbols used in groups combine syntactically to produce strings of connected meanings; today, strings of syntactically connected visual symbols, both in pictures and in writing, direct our thoughts, through iPhones and other devices, for example. The idea of the totem functions in the work of both Brian Bress and Nathan Mabry. The two Los Angeles-based artists first met while students at the University of California, Los Angeles (UCLA) in the early 2000s. In the years since then, in their respective bodies of work, Bress and Mabry have both considered connections of syntax and what these connections mean for art objects, their power and their interpretation. “Man with Cigarette (Black)” — a monumental multi-panel video work by Brian Bress — explores modular units in relation to an overall image. The video takes on the four monitors that make up “Man with Cigarette (Black)” are shot from different vantage points. The effect is a twisting and moving exquisite corpse in which the parts are at least as obvious - if not more so - than the whole, inviting questions about representation and how it coheres. At the same time, the piece explores how large-scale representations impact our psyche: the figure - standing at nearly eight feet - is undeniable in its presence. Nathan Mabry’s T/O/T/E/M multi-part sculptures utilize as one element a terra-cotta form derived from Peruvian Moche culture (100-700AD). In their original context, these forms were intended by their users to activate power with regard to life, fertility, and the cosmos. When combined with base forms loosely derived from 60s American Minimalist figures - a classic post-science art movement - the effect is uncanny. Neither form is able to operate in its original framework; the resulting cyborg forces each system of representation to wear the clothes of the other, as it were, and for the user to interpret the final result. Brian BRESS’s work work will be included in the upcoming, “Screens: Virtual Material,” (DeCordova Sculpture Park and Museum, Boston, MA). Bress’s work was recently featured in “In the Box: Brian Bress” (Chrysler Museum of Art, Norfolk, VA); “The Imperfect Tense (for Josef Albers)” (Baltimore Museum of Art, Baltimore, MD); “Commercial Break” (Public Art Fund, New York, NY); and “2016 Moving Image Biennial” (Centre d'Art Contemporain Geneva, Switzerland). His 2015-16 touring exhibition, “Brian Bress: Make Your Own Friends,” opened at Utah Museum of Fine Arts (Salt Lake City, UT); and traveled to Museum of Contemporary Art Denver (Denver, CO); and Orange County Museum of Art (Newport Beach, CA). Bress has had solo exhibitions and projects at the Los Angeles County Museum of Art (Los Angeles, CA); Museo d'arte contemporanea (MACRO) (Rome, Italy); Santa Barbara Museum of Art (Santa Barbara, CA); and New Museum (New York, NY). He lives and works in Los Angeles, CA. Nathan MABRY’s work was the subject of a recent solo exhibition at the Nasher Sculpture Center (Dallas, TX). Mabry’s work was featured in “Thing: New Sculpture from Los Angeles” (Hammer Museum, Los Angeles, CA); “Red Eye: Los Angeles Artists from the Rubell Family Collection” (Rubell Family Collection, Miami, FL); and “Thief Among Thieves” (Museum of Contemporary Art, Denver, CO). Mabry’s work is included in the collections of the Hammer Museum (Los Angeles, CA); Los Angeles County Museum of Art (Los Angeles, CA); Orange County Museum of Art (Newport Beach, CA); Museum of Contemporary Art (San Diego, CA); Phoenix Museum of Art (Phoenix; AZ); Dallas Museum of Art (Dallas, TX); Nasher Sculpture Center (Dallas, TX); Nelson-Atkins Museum of Art (Kansas City, MO); Whitney Museum of American Art (New York, NY). Private collections include 176 / Zabludowicz Collection (London, UK); The Rubell Family Collection, (Miami, FL); and Vanhaerents Art Museum (Brussels, Belgium). He lives and works in Los Angeles, CA.